Google will now let users add personal photos to the background of the traditionally minimalist search page, Google announced in a blog post Thursday. In what is perhaps a transparent effort to out-feature Microsoft Bing, Google is ditching its boring white background and letting users upload their own photos. The Microsoft Bing search site features a different, Microsoft-chosen background picture every day. Users are given three methods for customization--they can upload a photo from their computer, they can choose a photo from their Google-run Picasa photo album, or they can choose a photo from the public Picasa photo album. The feature is not yet available to all users, but Google said it plans to roll out the feature for U.S. users over the next few days. To change your Google background photo: click on the link in the lower left corner of the Google search page (if you do not see this link, the feature has not been added to your Google yet). Will a big hulking image on the search page background affect Google's load time, though? No, Google assured InformationWeek in an email, the load time will not be affected. According to a Google spokesperson, "The homepage does not load any slower. 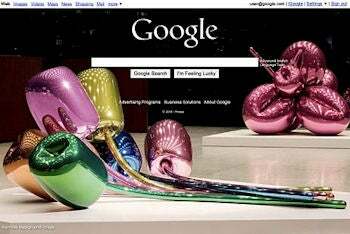 With or without a background image, the Google search elements show as quickly as before, allowing users to search just as quickly as without the new feature. We make this possible by post-loading the photo -- we load the search elements first and then load the picture into your browser cache and show it as soon as it is available. Meanwhile you can already perform your search." So it looks like Google is dedicated to user personalization--either that, or they looked at Bing and decided that perhaps minimalism isn't all it's cracked up to be. If you really enjoy Google's traditional search page, don't worry--you can still use it. Google's Marissa Mayer, vice president of search products and user experience, suggests that users start tweeting snapshots of their new Google search pages, using the Twitter hashtag #myGooglepage. I won't get started on how even Google thinks you should tweet instead of "buzzing."